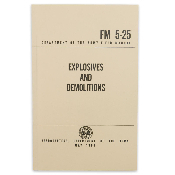 This professionally illustrated book includes chapters on demolition materials and accessories firing systems electrical and non-electrical. Calculation and placement of charges, timber cutting, steel cutting, breaching charges, creating and ditching, safe handling and storage procedures plus much more. Reprint from the 1967 Department of the Army. A must have for Navy Seals, Rangers and Special Forces Operations.